Eating high-protein snacks can help you lose weight. A recent study published in the Journal of the American Medical Association shows that skipping high-protein foods may lead to overeating and is often one of the biggest causes of excess weight gain especially during the menopause years. Take away the water in your body and about 75 percent of your weight is protein. This chemical family is found throughout the body – in muscle, bone, skin, hair, and virtually every other body part or tissue. It makes up the enzymes that power many chemical reactions and the hemoglobin that carries oxygen in your blood. Protein is also called the building blocks for the body. The body needs protein to build new muscles, cartilage, skin and blood. It is also needed in order for the body to make hormones, enzyme and many other necessary cells. Protein prevents loss of muscle mass and strength. Protein increases satiety (the feeling of being satisfied) more than carbohydrates or fats. Animal protein makes you feel full longer than plant protein. Incorporate these high-protein snacks for your Menopause Makeover. When you’re going for lean protein, low-calorie turkey is one of my favorite choices. Three ounces of turkey provides a whopping 25 grams of protein for only 140 calories. Deli slices can be high in sodium, so roast a small turkey for dinner and using the leftover slices as nutritious snacks. Homemade protein shakes can be a delicious way to add protein to your diet. Combine protein powder with nonfat milk or almond milk or low-fat soy milk, then add frozen fruit (blueberries rock in protein shakes), ½ banana for creamy texture, ½ tablespoon of flaxseed (or flaxseed oil), ½ tablespoon of honey, and you have a healthy meal replacement or high-protein snack. When you control the ingredients you skip the added sugar that often comes with store-bought protein bars and shakes. Diet staple low-fat cottage cheese is an excellent protein source, with a half-cup of low-fat cottage cheese providing 14 grams of protein for only 81 calories. Throw in some berries or your favorite fruit and it makes a terrific snack when you want to stay full between meals or can even be a satisfying meal all on its own. This snack makes an excellent way to start your day. Greek yogurt, which is strained to remove whey, is thicker and creamier than regular yogurt, making it a healthful stand-alone snack, a great mixer for fresh fruit, cereal, or nuts, and a healthy swap for fattier dairy products such as sour cream or cream cheese. The yogurt’s power comes from its protein — Greek yogurt contains 15 to 20 grams of protein in a 6-ounce serving versus 9 grams in regular yogurt. Add some berries for a yummy snack. Eggs have been getting a bad rap for their cholesterol content. Now the American Heart Association has come around and acknowledged that the benefits of eggs might outweigh the cholesterol risks when eaten in moderation (less than six whole eggs per week). One large egg contains 6 grams of protein and only 70 calories. If you’re concerned about cholesterol, many egg substitutes on the market offer lower-cholesterol alternatives that still pack a protein punch. Keep a bowl or hard-boiled eggs in your home fridge for an instant healthy snack. Tofu or soy bean curd is another excellent high-protein meal base and source of healthy fats and nutrients. Because it absorbs flavors so well and can be cut into cubes, strips, or chunks, it can be prepared in a variety of ways. Some research has shown that consuming soy can reduce risk of breast or prostate cancer, thanks to its high levels of phytoestrogens, though that link is still being studied. As vegans and vegetarians know, lentils pack a powerful punch of protein, fiber, and minerals while containing comparatively few calories and almost no fat. A cup of cooked lentils offers 22 grams of protein, about 300 calories, and less than 1 gram of fat. Lentils are also relatively quick to prepare for a meal or snack, and because they soak up the flavors of whatever they’re cooked with, they can make a tasty base for many dishes. Chances are, you loved peanut butter as a kid, but you may have shied away from this traditional treat as an adult because of concerns about fat. Peanut, almond, cashew and other nut butters are high-protein foods, with about two tablespoons providing 7 grams of protein. And though nut butter does contain fat and saturated fat, it can be part of a healthy diet when eaten in small amounts. Just remember not to slather it on crackers — instead, spread it on carrot or celery sticks for healthy snacking. Whether you go for cashews, walnuts, pistachios or any of the other varieties, whole, raw nuts are a healthy high-protein snack choice. If you’re concerned about calories, limit your nut intake to a handful or two, and remember that though nuts are high in fat, it’s healthy monounsaturated fat, which doesn’t clog arteries and is an essential part of a healthy diet. Plus, nuts are high in fiber, which when paired with their protein content, keeps you feeling full longer. It doesn’t matter which nut you go nuts for — they all have health benefits — but research consistently indicates that almonds might be the best of the bunch. Numerous studies have found that almonds can help lower levels of harmful LDL cholesterol. They are also extremely high in fiber, vitamins, and minerals, and have been shown to help manage weight. It is estimated that the average weight gain during the menopause transition is about 10 to 15 pounds. Well, I must not be average, because I gained almost 30 pounds in less than a year when I slammed into menopause! Frustrated that I could not find a solution, I sacrificed myself as a human guinea pig and figured out how to lose it all in just 12 weeks. To be successful, weight loss during menopause demands a new strategy. It takes more than cutting calories to lose weight during this life transition! I was surprised to discover, according to new research, that for many women menopausal weight gain is not entirely their fault. The first culprit is aging. Both men and women lose muscle mass as they age, which can lower the body’s resting metabolism, therefore increasing the risk of weight gain and accumulating body fat around the waist. Many women become less physically active in their 40s, 50s and 60s because life is busy; it’s a challenge to find time to schedule exercise. Less activity means less muscle mass, which means weight gain. Now get ready for the double whammy: Aging plus hormone changes. Studies claim that the perimenopause transition may contribute to increased fat in the abdomen, changing a woman’s shape from a pear to an apple with more of the fat disturbed around the waist. Here’s proof that weight loss is an uphill battle. As we age and slide into menopause, it is suspected that declining estrogen levels may lower the rate of energy used during exercise. Weight loss habits and workout routines used in younger years often aren’t as effective as we age. It takes more work to lose weight. Not achieving your desired results within a certain time frame may increase frustration and decrease motivation. Declining estrogen levels wreak hormonal havoc that can cause night sweats, and that is a formula for sleepless nights. Sleep deprivation produces increased levels of ghrelin – the hunger hormone – and decreased levels of leptin – the “stop eating” hormone. This can equal weight gain. Loss of estrogen may make insulin less effective at lowering glucose, and more effective at storing fat. Suffering from menopausal symptoms can affect a woman’s emotional health…weight goes up, self-esteem goes down. Normal life and environmental changes, such as children leaving or coming back home, divorce, death, career changes, can be stressful. The stress hormone, cortisol, directly affects fat storage and weight gain in stressed individuals. Cortisol is associated with increased appetite, cravings for sugar, and weight gain. There’s a link between estrogen and body fat storage. Post-menopausal women burn less fat than they did in their pre-menopausal years. Cells not only store more fat but are less willing to part with it. Medical conditions such as insulin resistance (when your body becomes resistant to the insulin it produces) or suffering from an underactive thyroid can pack on the pounds. Medications that can trigger appetite, slow metabolism, increase fluid retention, and cause muscle cramps decreasing desire to exercise are: antidepressants, antihistamines, beta-blockers, corticosteroids, insulin, statins and tamoxifin. It is no surprise that most women going through “the change” struggle with weight gain more than with troublesome hot flashes. Weight management during menopause is important because weight gain increases the risk of many diseases, including cardiovascular disease, type 2 diabetes, high blood pressure, osteoarthritis, and some types of cancer, including breast and colon. There is good news! Put that glass of Merlot down and walk into your kitchen, because incorporating a new strategy can help you obtain and maintain a healthy weight. How food can set you free. Feeding the new you! Eat Protein: Women naturally have less muscle mass and testosterone than men, so lean proteins such as, chicken, turkey, fish, beans, soybeans and tofu, dairy protein/Greek yogurt, low fat cottage cheese, egg whites, are a woman’s best friend during menopause. Your body expends more energy (calories) to process proteins. 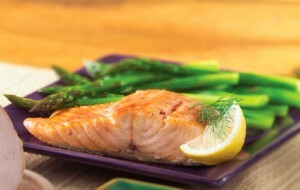 Consume healthy fats: olive oil, flaxseeds, salmon, halibut, tuna, avocados, almonds, and walnuts. Manage blood sugar with low to medium glycemic index foods: beans, apples, oranges, cherries, plain yogurt, sweet potatoes, oatmeal. Fiber is your friend keeping you feeling full longer and regular. Limit alcohol to 2 or less glasses per day: That totals less than 10 fluid ounces of wine, 24 ounces of beer, or 3 ounces of 80-proof distilled spirits. More than two drinks per day may increase the risk of cancer and stroke. Watch salt intake to reduce fluid retention. Practice portion control. Using smaller plates can help. Keep a food diary and create a food plan. There are many great apps for your mobile that may help. Eat every 3-4 hours so you don’t get hungry. Three meals and two snacks per day (three if you wake up early). Exercise at least 30 minutes most days of the week to maintain a healthy weight; increase workout time if your goal is to lose weight. Make breakfast and lunch your largest meals. Nourish healthy emotions: are you happy, are you surrounded by healthy relationships, is your self esteem high? If you want to enjoy some dessert after dinner, then don’t eat a starchy carbohydrate, such as white rice, with that meal. For example dinner can be broiled chicken, steamed veggies and a glass of red wine. Then you can have your cake and eat it, too (small serving). Weight loss is possible with a few changes. Negotiating the Glycemic Index is a powerful tool. Aim for low to medium glycemic foods, toss in some physical activity and have realistic expectations. I am so honored to be a part of the Fashion Flash! Winding down for the last weeks of Summer. At Black Cat Plus, we are getting ready for Fall! Exciting items coming in daily! You get the best-of-the-best with these amazing women! So,see below, for this week’s best from our fabulous bloggers as they talk about getting the most out of the last few weeks of Summer! Kari from Fab Over Forty shares with us how she takes her summer beauty to fall beauty with her favorite beauty transition pieces. It may be the end of summer, but keeping a healthy weight year round is important especially during the winter months. Eating high-protein snacks can curb cravings and increase metabolism.MenopauseMakeover.com has a great list of high-protein snacks to help you obtain or maintain your healthy weight. Prime Beauty introduces the LUNA, a new skin cleansing and anti-aging device that has her ready to abandon her beloved Clarisonic. Read her review and enter to win your very own LUNA, a $200 value! Summer may be winding down, but the colorful fingernails trend is still going strong! Style expert Deborah Boland from Fabulous After 40 shows you how to freshen up your manicure with one of thesepopular nail trends that will flatter your fingers. Women’s Fitness Expert Mirabai Holland shows you how to use cross training to stay cool in summer’s heat. Summer winding down signals back to school. That means less time for morning beauty and skin careprep. Jackie Silver from AgingBackwards.com has shortcuts every mom could use for school day – or any day – beauty. Deb of No-Nononsense Beauty Blog explores a popular protein powder as a beauty food. Meet our newest blogger, Shelley Zurek of Still Blonde After All These Years. Vitamin D deficiency is a global problem that one company is addressing with its new products. Jackie Silver from AgingBackwards.com introduces this unique duo from Skin Authority for beauty on the inside and the outside. If you have an hourglass figure, it’s all about accentuating your curves and showing off your waist. So, what are the best clothes for an hourglass figure over 40? Get some tips from The Glam Gals at Fabulous After 40. With Spring around the corner its time to fight upper arm flab! Try these easy exercises for women over 40 by Mirabai Holland, Boomer Fitness Guru. Which comes first? Deb of No-Nonsense Beauty Blog explores layers of skin care products on the skin. Animal prints are here to stay and plus size women can surely take advantage of this enduring fashion trend. A recent study published in the Journal of the American Medical Association shows that skipping high-protein foods may lead to overeating and is often one of the biggest causes of excess weight gain especially during the menopause years. 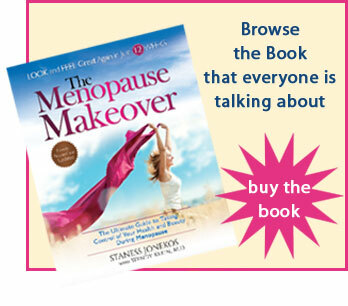 Enjoy Menopause Makeover approved protein snacks that are yummy! Who says women over 40 can’t wear color? Cindy from Prime Beauty learns how to adapt the Make Up For Ever Technicolor Palette to suit older women. As a woman over 50, author Barbara Hannah Grufferman is always looking for the latest facts and figures about this growing demo. Here are some of the latest. Barbara from BestofEverythingAfter50.com is HOSTING ‘FASHION FLASH’ THIS WEEK! CHECK OUT ALL THE LATEST NEWS ON HEALTH, STYLE, BEAUTY AND MORE . . . RIGHT HERE! Click on each of the articles below to find out everything you need to know this week. Enjoy! Never skip breakfast. Research shows that people who eat breakfast perform better at tasks, eat fewer overall calories and miss fewer days of work and school than those who don’t. Don’t overdo the caffeine. A daily cup or two of java is fine. Going overboard sets you up for fatigue later in the day. Avoid highly refined carbohydrates and seek out fiber. Carbohydrates provide us with much-needed energy, but choosing highly refined carbs over whole grains creates a blood sugar roller-coaster. Add a small amount of lean protein to meals and snacks. Protein takes longer to digest and absorb. When eaten with a carbohydrate, it slows the release of sugar into the bloodstream, sustaining energy. Choose small, frequent meals to fuel your day. Remember not to skip meals. Your energy levels can fall so low that you’ll overeat at the next meal or graze on unhealthy snacks. Get adequate sleep. Most of us need at least seven to eight hours to avoid fatigue, bolster immune defenses and perform at our best. Engage in regular physical activity. Exercise actually boosts energy levels, especially when done regularly. It can also help us sleep better.